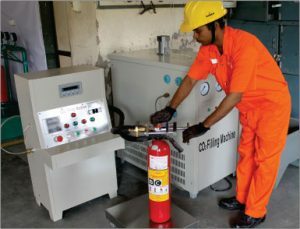 Our technician using the machine to punch nitrogen in a stored pressure type fire extinguisher after its inspection and hydro test. 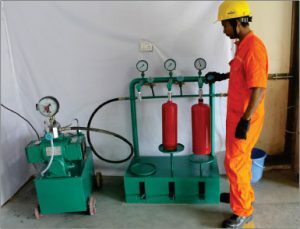 Our technician refilling and weighing a CO2 type fire extinguisher after service is completed. 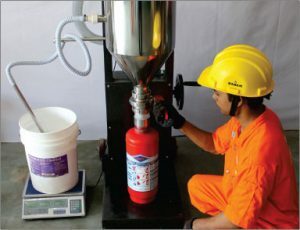 Technician using our refilling machine to refill powder in the extinguisher. 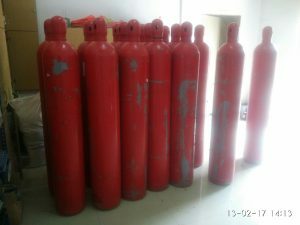 The machine has an in built filter that removes impurities from the powder before it is inserted into the extinguisher cylinder.